(Reuters) - A strong 6.0 magnitude earthquake occurred in the Sea of Cortez off Baja California, 60 miles east of La Paz, Mexico, the U.S. Geological Survey reported on Tuesday. The quake occurred at 11:44 a.m. local time (1744 GMT) at a depth of 3.1 miles. There were no immediate reports of damage. The drug trade and drug wars continue in northern Baja California and the rest of Mexico, as this week’s series in the Los Angeles Times abundantly shows. And the U.S. State Department is still warning travelers about the risks of visiting Mexico. But the rest of life continues too, as I found during on my trip across the border this past weekend. -- 9:20 a.m. Saturday, July 23: I join a group of friends on a chartered bus trip from San Diego. The destination: Ensenada, 95 miles south of San Diego and about 75 miles south of Tijuana. We pass through the border at San Ysidro with minimum delay and make one snack and bathroom stop. Entering Ensenada, we find the music throbbing as usual at Papas & Beer and Mango Mango, two loud bars that stand across from each other at the busy corner of Primera and Ruiz, drawing a clientele of thrill-seeking, hard-drinking young Americans. Along Lopez Mateos, the nearby main drag, the sun is shining and merchants are relieved to see us. Some of them say business has fallen 30% or more in the last year here as cruise ships have cut back port calls, car traffic has slowed and tour buses have stopped coming. Except the bus I rode in on, of course. 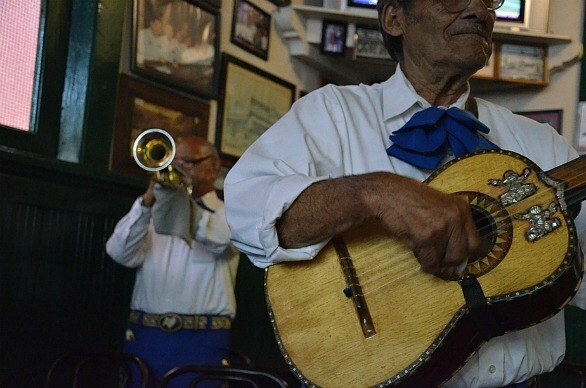 There are 27 of us aboard, some in their late teens, some in their 70s, most in between, on a mission to honor a fallen friend by listening to a few dozen of his favorite mariachi songs at Hussong’s Cantina. Probably you’ve heard of Hussong’s. It goes back to the 1890s, has sawdust on the floor and has long been beloved by many old hands in Baja. The crowds these days may not match the glory days of decades past, but the musicians remain. And bartender Martin Fria tells me that business is actually up in the last year, in large part because the saloon has been cultivating more Mexican customers. About 80% of customers now are Mexican, he says. In the space of about three hours, I see two wedding parties, fancy outfits and all, come sweeping in for a few rounds between their ceremonies and later festivities. A little after 4:30, we pile back into the bus, having heard many favorites: "Guadalajara." "Viva Mexico." 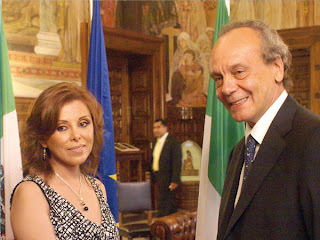 "Paloma Negra." Besides our bar tab and musician bill -- about a dollar per player per song -- we had lunches in a handful of restaurants nearby (good mole at El Charro on Lopez Mateos), spent a bit on arts and crafts, and paused a minute to marvel at the young woman drinking from a funnel and hose on the Mango Mango patio. 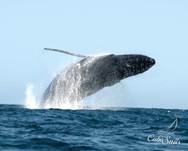 Then we're rolling, cheering as a pod of whales spouts offshore, then cheering again as our driver, Ramiro, artfully dodges a car ahead of us when it suffers a blowout and veers across our lane. -- About 6:30 p.m.: The day-trip’s crowning event comes right at the San Ysidro border crossing. Partially, it's because of thin Saturday evening traffic, which we’ve been hoping for. Partially, it's because we're in the bus lane. And who knows what other variables enter the equation? But the result is no wait. No delay at all. No time for any vendor to attempt to sell us anything. We roll right up to the line, hop off the bus as directed to pass through U.S. Immigration, then hop back on the bus. Besides the usual three toll booths along the toll road, we passed one checkpoint with armed officers -- par for the course in recent years. In 13 years of driving, says Ramiro, he’s only once before had it this easy. In about 30 years of visits, I’ve never seen a border crossing so smooth, nor have any of the other travelers. For a close-knit group of anglers from northern California, the early morning of July 3, 2011 will be etched in their minds forever, at least the minds of those who survived. At approximately 2:30 am, a freak storm known and dreaded by natives of Baja, called an “El Torito”, or little bull, managed to bring down the 115 ft. fishing vessel that was caught in its path. 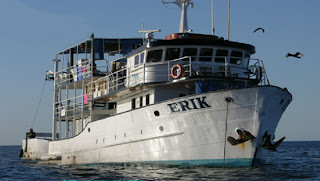 For this particular voyage on the Erik, there were 43 people total on board, 27 American fishermen, and 16 crewmembers. The annual tour was a much-anticipated 4-night trip for the men to fish, laugh, eat like kings, and tell tall tales of the high sea. Only, the tale the survivors are left with is a story they wish they had never been a part of, a story that ended with one of them washed up lifeless on a sandy beach and the fate of seven others still unknown. According to survivor reports, the trip began typically enough, just with a slight delay. They had a fantastic meal while waiting; which was always a given when the guys took a trip on the Erik. When the Erik, operated by Baja Sportfishing Inc., did finally venture out, it was immediately called back to dock by the Federales. While unusual, no one seemed alarmed. Speculation has swirled that the authorities were warning the Captain of an impending storm. Some accounts now surface speculating the Captain chose to ignore whatever warning the Federales were imposing on him out of impatience to get the already late trip started. Again, this dismissive attitude and contents of the actual conversation are all speculation by a few survivors. Aside from this out of the ordinary start to the trip, there was no reason for anyone on board to expect anything other than the great time the group had been enjoying for several years together. According to documented reports, the storm came fast and hard. The winds blew steady at over 50 knots for hours. The waves were epic. Moreover, according to survivors Gary Hanson and Jerry Garcia when they publically told their tale of survival, the Captain made one very huge mistake at the helm. Reports say he drove away from the overpowering and relentless waves instead of into them, which maritime school of thought says would have been easier for the ship to weather. Published official reports say a rogue wave overtook the vessel; but the American survivors and families have come forward with a story that lets the El Torito off the hook as the sole reason seven men never made it home. As the boat took on water and the bashing of its sides became worse, the Americans began to wake. Chaos was already unleashed as the crew was scrambling to save the ship. Oddly enough, every member of the crew was already fitted with life jackets. Within minutes, the California tourists knew they were in serious trouble. 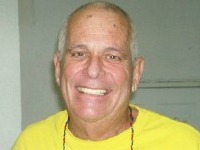 Dave Levine summed up the moment to local papers as pure “pandemonium”. Darkness, confusion and a boat that was quickly losing its battle against the little bull resulted in a mad dash by the men to find life jackets on their own get their bearings straight and try to save themselves. 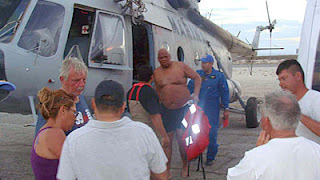 Survivors who saw the Captain in those final moments aboard the Erik describe him as paralyzed with fear and looking “bug-eyed”. The crew and Americans together were all washed overboard by one final epic wave, sending them flying, and gurgling seawater as they were scattered into the dark, deep ocean. Bob Higgins and Steve Sloneker were amazed by the final wave and felt like they were being shot out of a canon. Large ice chests meant to hold the catch of the lifetime for these experienced anglers were now bobbing all around the boat. Men struggled to grasp onto the coolers and the lights went out as the sea swallowed the massive vessel quicker than any witness still could ever believe possible. Some survivors contend the entire ordeal was over in about 3 minutes. The men who made it off the boat went from nervous sleep due to excessive waves crashing while they tried to get comfortable in bunks to getting continuously smacked by the sea while hanging onto coolers dotting the now empty horizon all in a matter moments. Yells to find each other and struggles to stay above the waves soon led to silence as the men realized the gravity of what had happened. They assessed who was last seen where and who was no longer right beside them. They also realized no distress call, no May Day, no SOS, no flares, no tracking device was on board and no call for help was sent. Therefore, no help was coming, only they never would have believed no help at all would come for over 15 hours. As the men huddled around coolers and debris, the sun rose and started its slow burn into their flesh. Because they had been sleeping, most were in underwear and exposed to the harsh ball of sunlight overhead. Sharks were seen, but luckily none felt. Thirst, delusion, despair, and thankfulness that at least the 85-degree water was comfortable set in as the hours passed. Luckily, for the men, Michael Kalicki would soon know of their plight. Kalicki knew the storm had been fierce the night before; but would find out how fierce when a skipper from the Erik who actually was a neighbor of his came running up from the beach. He swam until making landfall and came ashore right in front of Kalicki’s house. As the skipper desperately conveyed the story of boat sinking and the people still out there needing help, Kalicki quickly verified what he was being told. Using a satellite phone, he was able to alert the Mexican consulate, the U.S. consulate, and military authorities in the area. Kalicki could have left his contribution at that; but that just is not his nature. He knew people out there needed help so he and his father took his 18ft skiff boat out immediately and headed straight toward where they were needed. Once Kalicki spotted the debris field, he called in the latitude and longitude to help authorities get there quicker. Soon after finding debris, they found the first American to be pulled out of the water. Kalicki says, “He was hallucinating, incoherent and crying ‘thank you God’” .Ross Anderson was severely sunburned and in need of water. Looking for survivors, helping to pull people aboard and directing panga fishermen and rescue boats to pick up survivors he could not fit was how Kalicki spent his day. He says, “We didn’t know what to expect out there. We were zigzagging. It was surreal and we didn’t have time to think.” He was given body bags to have ready in case he needed them. Luckily, he says everyone he found was alive and he feels that was the way it was meant to be. Kalicki swears he never had to steer his boat toward anyone. He says, “They were all right in front of us. We came across survivors quickly and moved on to the next group. It was divine intervention.” He had the distinction of picking up the first survivor and he found himself back out at night steering towards the last American who would be plucked from the sea. Kalicki found Dennis Ledec hanging on to an ice chest and patiently waiting to be rescued. He declared the water fine and said he was just out fishing. Kalicki says he felt an instant camaraderie and soon realized this survivor was more lucid and in a light-hearted mood compared to the others because he was bobbing along with clothes on to protect him from the sun and his life-saving cooler was filled with all the bottled water he could possibly need. As Kalicki drove back with Ledec safely on board, he says he felt an overwhelming sense of peace and knew “We found everybody that was alive that day.” Only after realizing there were seven men still missing did Kalicki question if he had done enough, as anyone would in that situation. When asked if he felt like a hero who saved fellow Americans, Kalicki believes he was just doing what anyone would do. He says all you can do is help when needed and “hope to hell that somebody is there for you to give you a hand up” if you ever need it. While the survivors gathered calling family and recounting their ordeal, some staying overnight at Kalicki’s house and others being flown out, the extensive search and rescue was underway for those still unaccounted for. Don Lee, Russ Bautista, Mark Dorland, Brain Wong, Al Mein, Gene J. Leong, Shawn Chaddock and Leslie Yee were not picked up by rescuers. Leslie Yee died after trying to swim for shore and was found on a remote beach. The others still have not made it home. Families were grateful for the cooperative and extensive searches by both Mexican and American officials. Even after an extension, the official search was called off on July 15. This left families waiting for a search and recovery mission that meant divers would hopefully enter the remnants of the Erik and bring remains of loved ones. The dive never came. The recovery is stalled. Mexican officials contend they do not have the necessary equipment and gave full permission for the U.S. to recover the ship. The U.S. contends it does not have the financial resources to conduct a recovery. Bureaucratic red tape, unanswered questions about the facts of the sinking, and unanswered pleas for help is what the families of the missing have been left with. Don Lee, 62, was central to the group and is still out there with his fishing buddies. He knew every one of the passengers and made the voyage annually with a mix of some of these guys. His family and the families of others have been very vocal in their anger over the aftermath. The survivors tell of not enough life jackets, a lack of adequate communication gear, Captain error, and what some have deemed as gross negligence. 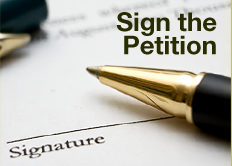 The families want accountability and want to ensure no other fishing venture ends in tragedy. They all question the safety of the boat, the warning of a storm, the ridiculous amount of time the men waited for rescue and why the crew was outfitted in life vests before any attempt was made to wake and prepare the fishermen. Mourning what they know is the loss of their husbands, fathers, brothers, and friends is difficult beyond words; but for the families the lack of remains and lack of answers is becoming unbearable. Frederick Han, Don Lee’s son-in-law, has created an internet campaign to tell the world about Don, raise awareness of the efforts to bring him home, and raise funds to finance a private dive to do so. Han says Lee would want his friends brought home. If Lee had survived, he would not have given up until all of his friends were home too. Lee was passionate about his fishing trips and the friends he shared them with each year. Han says, “He loved sharing videos and meeting people. He would have more pictures of people than fish. He was looking forward to taking his grandsons out there someday.” To make the Lee family ordeal even more difficult, Don Lee’s mother passed away after a long illness while the search was still going on. She never knew the fate of her son. This compounded loss makes Han and his in-laws even more determined to find Lee. While the Lee family is strong and dealing with the double loss, Han says they are determined to “make sure no one goes through this again. In our downtime we are asking ‘what can we do?’”. 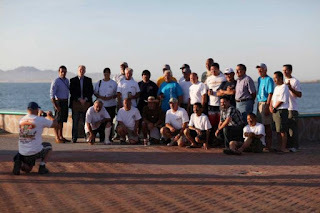 Han’s blog about his father-in-law has helped reconnect those who loved him and reminded everyone of what a generous and warm soul was lost in the Sea of Cortez that night. Don Lee’s legendary meals and disarming demeanor will leave a hole in the family; but has propelled them to fight for the truth and take action to fund the dive. 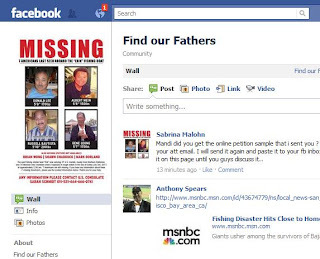 A petition to get the government to fund the dive and resources to raise the funds independently has been coordinated through the site www.findourfathers.org. Family members of the missing point out that two of the missing were veterans; therefore, the American government has no excuse to leave them behind because of the cost of a dive. The estimated cost to bring the seven men home is $300,000. This amount would bring answers, closure, and ability of the families and countless friends to mourn and move on. The group also wants the Mexican government and Baja Sportfishing Inc. to account for discrepancies and investigate whether true negligence led to the deaths of these men. Currently, Find Our Fathers has established several active fundraisers in Livermore to raise the money and help pressure the government for answers. Fundraisers will be held at Melo’s Pizza, Rodrigue Molyneaux Estate Vineyard and Winery, Rigatonis and Casa Orozco. Don Lee’s daughter Mandi Lee-Han has also enlisted the help of the Valley Montessori School she works at. Frederick Han says after he first had dinner with Don Lee, as a young man courting his daughter, he walked in nervous and walked out hours later thinking “I couldn’t wait to come back.” Don Lee embraced the world around him. He wanted to know everyone, make everyone smile and make sure everyone always had enough on their plates. He and his friends are still out there, more than likely still trapped in the remnants of the boat he loved to spend time on. His family wants him home along with the men he cared so deeply for. 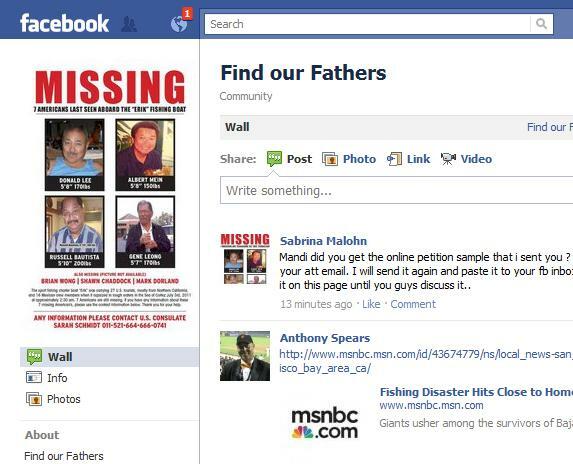 They are pleading with anyone who may be able to help make that happen to step forward and donate to www.findourfathers.org . While the survivors are all extremely grateful to the gracious people of San Felipe and Baja as a whole for the care they received, they too want the truth told and to make sure this never happens again. While safety standards differ between the U.S. and Mexico when it comes to the chartered fishing tours that are so popular between the two countries, certain standards should be held across the board. Certain procedures, training, and knowledge should be part of every chartered fishing trip. Each of these men left behind loved ones and a full life to have a great couple of days together and it ended in tragedy. Whether that tragedy was an unavoidable act of God or a combination of that, human error and disregard for safety remains to be told. Either way, the survivors of the sinking of the Erik and the families of the men who are still lost are not giving up on finding those answers anytime soon. TIJUANA — Long lines of visa applicants have for years been a fixture outside the offices of the U.S. Consulate General in Tijuana, hub of one of the busiest American consular districts in the world. This week, the lines have suddenly vanished, even if the activity hasn’t. After 47 years in the same location near the Caliente Racetrack, the U.S. government has moved across town, on Monday opening offices in a $120 million gated compound built near the Otay Mesa border crossing. 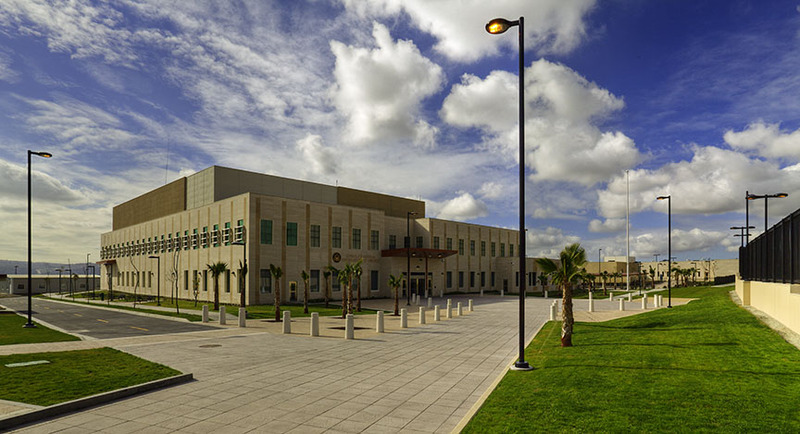 The imposing stone structures — with more than 100,000 square feet of space in the main building — are intended to offer both greater efficiency and tighter security at a time when the consulate’s role has grown increasingly complex. 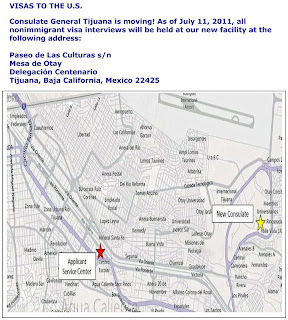 High-volume consulateSome average annual numbers from the Tijuana consulate, which serves the Baja California peninsula. While the U.S. Embassy in Mexico City serves as the State Department’s main representation in Mexico, the U.S. government also maintains nine consulates across the country, with Tijuana and Ciudad Juárez being the largest and busiest. In Tijuana in recent years, growing numbers of U.S. agencies have begun operating out of the consulate’s office, and now include Immigration and Customs Enforcement, the Drug Enforcement Administration, the Federal Bureau of Investigation, the Bureau of Alcohol Tobacco and Firearms and the Department of Commerce. “Clearly in a country like Mexico, where U.S. interests are so multi-faceted, in a city like Tijuana that is such an important element of the national fabric, the consulate assumes a role that a consulate in Lyon, France, might not,” said Jeffrey Davidow, a former U.S. ambassador to Mexico. The Tijuana consulate had long ago outgrown its rented facilities in the city’s upscale Hipódromo neighborhood, and in recent years found itself forced to open a visa annex a few miles away in the city’s Río Zone, where lines of applicants carrying documents could be seen standing outside throughout the day as they waited for appointments. The new facility commands a sweeping view of the city, and sits surrounded by vacant land on a large plot known as La Pechuga, so-named because its shape resembles a chicken breast. The setting and structure meet U.S. State Department security standards for diplomatic facilities worldwide established following 1998 bombings of U.S. embassies in Kenya and Tanzania that claimed 220 lives. Though less centrally located than the old facilities, the opening of the new consulate consolidates all of the operations in one location. Shaded areas with benches inside the compound allow for a more comfortable wait. 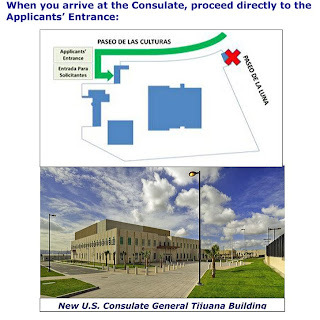 The central atrium of the newly opened U.S. Consulate General in Tijuana. — Nelvin C. Cepeda The Tijuana consular district, which oversees U.S. government affairs in Baja California and Baja California Sur, has an estimated 250,000 U.S. citizens living within its jurisdiction, a figure that does not include the millions of others who cross each year for tourism, jobs, family, and business. More people are arrested here than in any other U.S. consular district, about 2,000 annually, according to consular figures; drug and weapons charges are among the most common. At any given moment 250 U.S. citizens are behind bars, though any definitive tallies are difficult because some may hold dual citizenship and not identify themselves as U.S. citizens. On average, one U.S. citizen dies each day in the district, in the majority of cases of natural causes, the consulate reports. While most of last year’s 66 non-natural deaths were homicides, they also included car accidents, drownings and seven suicides. “We are the highest volume, most complex American citizen services post in the world,” said Kashkett, whose previous posts have included Halifax, Port-au-Prince, Beirut and Jerusalem. While the consulate can help those who lose their passports, are victims of crime, and recommend attorneys to those who face charges, “Americans need to understand that they live in a foreign country, the laws of the foreign country apply,” Kashkett said. Some find the help invaluable. ■ Each participant will put 35 kilos of ceviche for tasting. ■ Fish and seafood used must be from the Sea of Cortes. 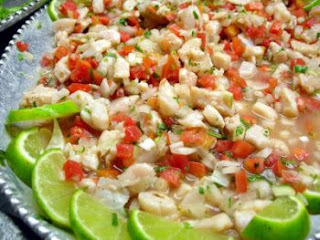 ■ Booths will be free for restaurants who introduce themselves with ceviche tasting and sales. ■ For those who just want to sell and not enter the contest booths will cost 1500 pesos. ■ The tasting will be from 2:00 pm to 8:00 pm in the afternoon. ■ At 12:00 p.m Staff will weigh the ceviche to check if it meets the rule of 35 kilos. ■ From 8:00 to 12:00 you can proceed to leave things to the event, thereafter the doors will be closed and no cars will be allowed to take things off at the stands. 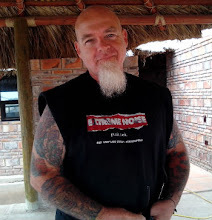 Puerto Vallarta, Mexico - Recent reports strongly indicate that the highly televised Mexican drug war has not stopped most Americans from traveling or moving South of the Border. In fact, according to an ABC News report, of the 5.25 million Americans living in other countries, the vast majority (over 1 million) live in Mexico, and many more may be on their way. A number of Mexican communities now virtually look like U.S. suburbs and in some cases American and Canadian property owners outnumber locals. In areas far from US border towns, such as Puerto Vallarta, Playa del Carmen and Tulum, Mexico’s drug war is a distant and far away place. In fact, when surveyed, most Americans living here feel that they are much safer than in cities like L.A., New York, Chicago, Atlanta or Miami. Indeed, recent statistics prove them to be right. 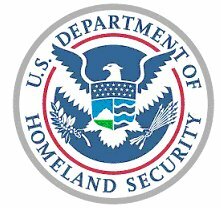 According to a report last year by the LA Times, tourist areas in Mexico are 12 times safer than Tampa or Honolulu, 17 times safer than Dallas or West Palm Beach, 26 times safer than Orlando or Houston and a whopping 39 times safer than the U.S. capital, Washington D.C., and Americans and Canadians are coming in droves. Americans and Canadians are sneaking South of the Boarder for all the usual suspects: tropical weather, pristine property, tree-lined beaches, white-sand, warm turquoise water, crystalline coastlines, the beckoning beach lifestyle, and a litany of other adjectives. But perhaps this time they are descending on magical Mexico for a compelling new impetus altogether. When the global recession hit, many retirees and investors were driven south where life is cheap and the living is easy. A dollar down here buys roughly 30% more, taxes are negotiable, and the economy is rebounding at a rapid pace. Personal debt and the credit crisis are virtually non-existent since Mexicans do not generally use credit to buy things. That could explain why the Mexican economy is surging (not sputtering) out of the global recession, recording a 4.3% growth rate in the first quarter of 2010 alone (much faster than the U.S.) And if you had invested $10,000 here in 2000 you would have witnessed a 232% gain in your bank account. Perhaps the biggest bonus for retirees and investors in Mexico has been their opportunistic purchases of homes, condos and real estate property. 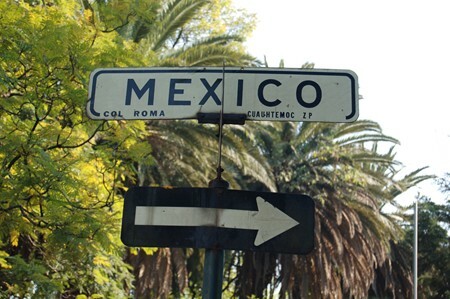 In key areas, real estate in Mexico is far outpacing growth in other countries. For example, Playa del Carmen was named the fastest growing area in the world just a few years ago and Tulum, just to the south, is poised to grow even faster in the next 5 years. The other goldmine that Americans and Canadians are getting in Mexico is the veritable healthcare jackpot they enjoy that includes full medical, dental and vision coverage for about $600 a year. This government run healthcare plan (IMSS) was created for Mexican employees but is also open to legal foreigners. Imagine a healthcare-fantasy world where there are no deductibles, no co-pays, no limits, no prescriptions to pay for and even pre-existing conditions are covered after 1-2 years. No small reason to make your way to Mexico. There are now over 18,000 major American companies currently investing and operating in Mexico and it is estimated that over 1 million Americans are buying, building and or retiring here. In truth, no one knows exactly how many American or Canadian retirees, entrepreneurs, and families are now traveling or making plans to relocate to Mexico. July 16, 2011, San Felipe, BC - Thanks to the goodwill and generosity of Cuba Gooding Sr., Dr. Jason Arias Corpus, and the community of San Felipe, the first 19 children from two orphanages will begin receiving much needed dental care. On June 18, the Baja Good Life Club produced a musical fundraiser in San Felipe. The sold-out event featured a night of music by Cuba Gooding Sr., the lead singer of “The Main Ingredient”, best known for their 1972 smash "Everybody Plays the Fool". 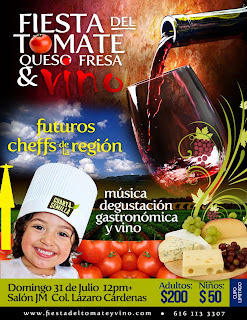 The event was a fundraiser for two orphanages, Casa de Fe in San Felipe and El Oasis in Valle de Trinidad. It was held at the Pavilion in El Dorado Ranch, and the proceeds raised will pay for the dental work needed by the 55 children of both homes. Dr. Jason Arias has significantly reduced the dental fees, in addition to closing his office during the children’s visits, so that he can focus on them. The children will be broken into smaller groups and brought to his office, so that he can provide all of the children with personal quality dental care. Dr. Jason Arias will begin examining the children next week. The first 15 children from El Oasis on Friday, July 22nd and the first 4 girls from Casa de Fe will be seen on Sat. July 23rd. Dr. Arias will clean and examine all the children, identifying those with the greatest or most urgent needs. The Baja Good Life Club and Casa de Fe work together to support the needs of children throughout Baja. 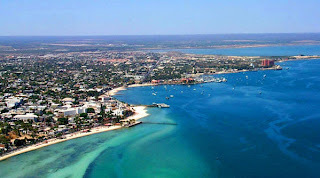 Their next fundraiser is the Baja Love Ride, being held in La Paz, Baja California Sur March 21-24, 2012. The Baja Love Ride is a 4-day, 230-mile bicycle tour from La Paz around the cape and back to La Paz, during the 6th Annual Festival de Arte y Cultura. Thanks to the generosity of the people of Baja these children will be given the care they need. Communities in Texas, New Mexico and Baja California, Mexico, will split just more than $5 million in U.S. federal grants for environmental-related projects, the San Antonio-based North American Development Bank announced Wednesday. The Border Environment Infrastructure Fund grants come from the U.S. Environmental Protection Agency and are administered by the NADBank. Rio Grande City will receive a $448,522 grant for sewage collection service to 27 households on Water Street, which now rely on failing septic systems. Anthony, N.M., will receive $2.8 million to improve water quality and water supply. The project's total cost is $8.8 million. Tijuana, Mexico, will receive two grants totaling $1.9 million for the expansion of sewage collection systems. All projects will receive additional technical assistance grants from the Border Environment Cooperation Commission to assist with final design. The U.S. Coast Guard and the Mexican Navy have called off the search for the seven fishermen missing since last week after their boat sank in the northern Baja during a storm. "Despite the thorough search of the region by Mexican and U.S. search teams no signs of the missing men were found," said Rear Adm. Joseph "Pepe" Castillo, commander of the U.S. Coast Guard's 11th District in a statement on Tuesday. "Our deepest sympathies go out to the friends and families of the missing men." Two Sonoma County men are among the missing following a July 4th fishing trip that went horribly wrong. Now relatives are struggle with the agonizing wait, each day receiving a call from the U.S. Consulate telling them the same thing: "We have no news." Many had placed their hopes on divers who were supposed to explore the sunken boat on Sunday. But so far the dive has not occurred and no one knows when it will happen. A phone call and email to the U.S. Consulate in Tijuana, Mexico, was not immediately returned Tuesday afternoon. Meanwhile, the family of Petaluma resident Shawn Chaddock has been on edge. "I don’t want them to leave the families wondering," said Shawn Chaddock's brother, Darryl. "If they are down there, the families will at least have closure. We need answers." Penngrove resident Russell Bautista, 60, is also among the missing. The U.S. Coast Guard has conducted 10 search flights since last Monday, covering a total of 7,000 square miles of land and water with no trace of the fishermen. 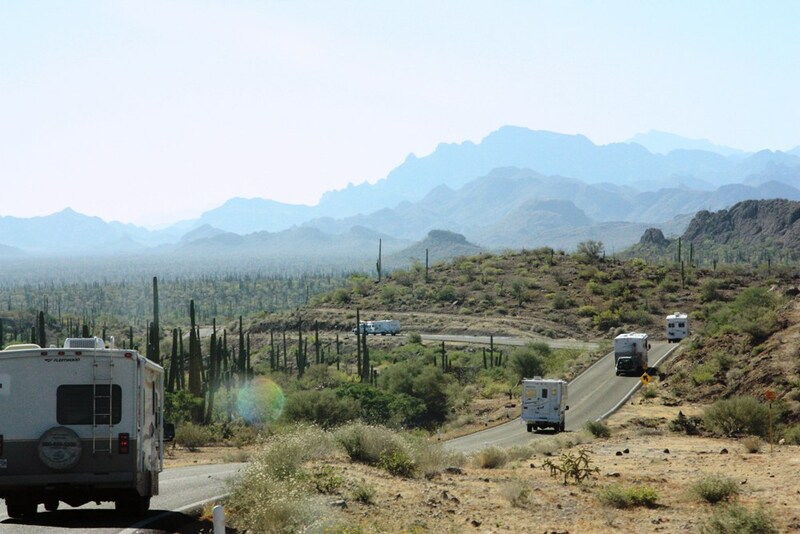 TRAVEL - Why Choose an RV Caravan to See Baja? Traveling with any RV Caravan Tour on your 1st driving trip into Baja minimizes stress and anxiety and provides built in camaraderie. 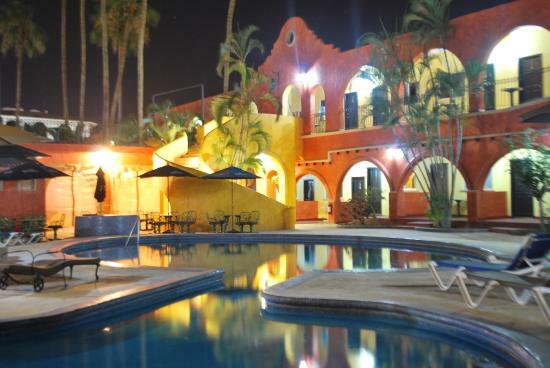 There are eight (8) RV Caravan Tours operating on Baja at many different price points, offering a diverse array of features. The major benefits of a Baja Amigos RV Caravan include traveling with experience, no planning required, 1000 km of hosted on-tour van excursions, ability to drop off and pick up again, built in camaraderie and the added benefit building the confidence to return to Baja on your own or with friends in the future. Our guests have told us we take 5 years off the learning curve of RVing in Mexico. We really focus on maximizing the enjoyment of your RV camping experience, ensures you visit the important sites, provides reserved and paid camping, takes you to excellent locations to shop & eat; every day we share our experience and knowledge of camping in Mexico and Baja. 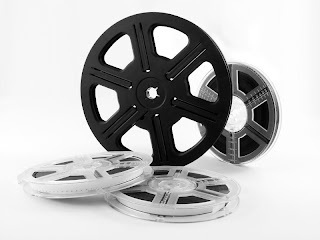 Our priority is personal service and delivering a superior experience at a competitive price. That is why our caravans include all Mexico camping fees, pre-paid FFMs (Tourist Cards), and are limited to 14 people maximum and much more; check out Our Tour Information page. That can be 7 RVs including the WagonMasters with 2 persons each or can be more RVs with singles or less RVs with families. We utilize a 14 passenger van for included optional hosted on-tour excursions which are specifically designed to let everyone in the caravan relax and enjoy what Baja has to offer once we reach our destination. These excursions ensure everyone can sight see, have fun and are a big part of providing you with the tools necessary to comfortably drive, camp and explore Baja on your own in the future. Believe us when we say, traveling with a group of 14 is very different experience then traveling with a group of 20, 30 or 40 people. We have heard from many RVer’s on Baja who have complained about their experience with other RV Caravans; to many people, felt like they were always waiting to fuel up or line up to park in a campground, or felt rushed . We understand we are not the cheapest nor are we the most expensive; we are an exceptional value, consistently exceed expectations and always ask our guests to extensively evaluate every aspect of our tours on completion to ensure we are delivering what people want and expect. At the end of the day, you get what you pay for. Believe us, we are a bargain when you compare our tour to our competitors! 7/14/2011, San Felipe, BC - With a deeply saddened heart, I write this letter to let you know that Sgt. Garcia of the Imperial County Coroner’s office called and inform Rachel and I, that our dear friend Steven “Dogman” Forman passed away yesterday at the age of 65, in El Centro while at the post office. At this time, we are notifying people close to Steven and getting his dogs care and shelter. The reputation and image of Mexico is under attack by a negative corporate media campaign focusing almost exclusively on drug violence and US immigration issues. Relentless coverage of these problems is only increasing xenophobia, stoking racism, polarizing politicians, ruining international commerce, and imperiling the relationship between the US and Mexico. The world needs to hear the positive news of Mexico --which vastly eclipses the negative in relevance but not in coverage--to inspire these countries to work together to solve their mutual problems. "Moderate the US media's sensationalistic and damaging reporting on Mexico to promote a healthier relationship between these important neighboring countries." From: 10:00 a.m. to 2:00 p.m. and 4:00 to 8:00 p.m. In the facilities of Baja Studios, Tijuana – Ensenada km 32.8. Rosarito # 22710, Playas de Rosarito, Baja California, México. We need to recreate an American town at the studios, so we are looking for People of Caucasian origin or European appearance of both sexes and "ALL" ages! They will be paying 70 dlls per day. They don't need experience, and we can accommodate the dates of those who can only work some days. It would be of great help if you could tell me how can I invite everyone, because I need at least 300 people. The Baja Good Life Club is making some exciting changes and additions to our publishing and services. As always our goal is to provide our members with The information and saving to make living the Baja Good Life easy and it’s to this goal that we are making these improvements. 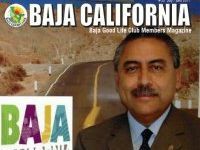 Baja Good Life Club will begin publishing annual community guides for 10 Baja communities; the first being San Felipe, followed by Rosarito and Ensenada, all due out by October 2011. These guides will provide up-to-date information on each community as well as comprehensive directories. These books will be available to members at a special low rate of 30% or more. These books will also be customizable, so that hotels, vacation rental companies, real estate companies and the like, can personalize editions just for their business. As of this edition, Baja California Magazine will begin publishing quarterly with special summer, winter, spring, and fall editions. Our goal as stated is to provide useful information to visitor and expats, and provided a limited page count edition of the magazine monthly is not efficient, it’s costly to print and because of that the page count must remain low. By reducing the frequency of the editions, we can greatly increase the content of quarterly editions. Lastly, in an effort to As of July 1, we are no longer requiring Baja businesses to be BGLC members in order to offer our members discounts. This means that any business can offer discounts to our members, thus greatly increasing the number of discounts available. Our goal is to double our member discounts by years end. 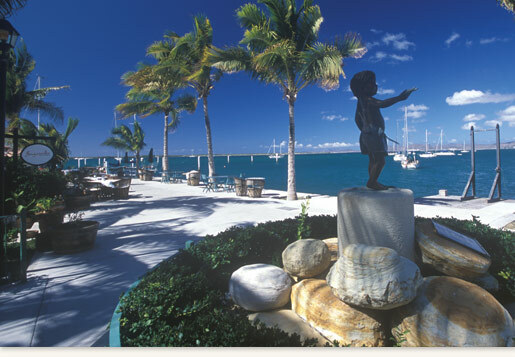 Baja Good Life Club membership is your premiere Baja retirement and travel club. LOS ANGELES—SCORE International confirmed today that the next race of five-race 2011 SCORE Desert Series will be the new Tecate SCORE San Felipe Challenge of Champions to be held Sept. 9-11 in San Felipe, Baja, California, Mexico. The race replaces the Primm 300 race that was cancelled this year because of insurmountable insurance issues. 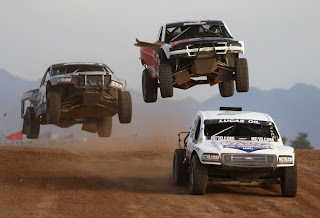 The new race, for 17 Pro and 2 Sportsman classes for cars and trucks, will run over the same course that was recently used for this year’s MasterCraft Safety Tecate SCORE San Felipe 250 in March of approximately 250 miles. After executing the event agreement today in Baja California with SCORE President/CEO Sal Fish, Francisco Perez Tejada Padilla, Mayor of Mexicali stated that, "The cities of Mexicali and San Felipe are pleased to announce that SCORE has decided to continue supporting Baja California by adding another race to their calendar in Mexico. This shows the great communication achieved by the Federal, State and Municipal authorities with Sal Fish. We are pleased that SCORE recognizes our previous hard work and continues to have confidence in our support. This new race will become the epicenter of desert racing during the month of September." Fish stated that, "While SCORE regrets ending a 16 year relationship with the Primm Valley Resorts and Las Vegas Events, we are pleased to open a new door with Mexicali and San Felipe and provide our participants with an exciting Baja racing challenge in the friendly, relaxing and scenic city of San Felipe." Elaborating on the cancellation of this year’s Primm 300, Fish confirmed that, "The sole reason for the decision was due to insurance requirements and cost. The Primm entities dramatically increased the liability insurance requirements for the event, which made conducting the event cost prohibitive." Thursday, July 7, 2011 | 9:52 a.m.
Mexican authorities said Thursday they will continue searching for seven U.S. men missing since a tourist fishing boat capsized and sank off Mexico's coast, pushing the effort past the standard 96 hours. Baja California state and Navy officials have decided to extend the rescue efforts "with the same intensity and personnel," despite the Mexican Navy's usual protocol to search for survivors for no more than four days, the state government said in a statement. Rescuers were coordinating with officials in the state of Sonora across the Gulf of California in case tides have swept victims or survivors there. Corey Bordenkecher of the U.S. Consulate in Tijuana, across from San Diego, said the United States has offered to send deep-water divers, but the offer has yet to be accepted by Mexican authorities. U.S. Coast Guard and National Transportation Safety Board officials will assist Mexican authorities in their investigation, Bordenkecher said. Sixteen of the 19 tourists who were rescued returned to the United States in their own vehicles on Thursday. Three brothers, Gary, Craig and Glen Wong, stayed behind to await news of their brother Brian, who was missing. A sudden storm struck early Sunday, capsizing the 105-foot (32-meter) vessel, the Erik. The crew and the fishermen clung to coolers, rescue rings and life vests for more than 16 hours. The navy and other fishing boats pulled 19 fishermen and all 16 crew members from the water late Sunday. The vessel sank about 60 miles (100 kilometers) south of San Felipe. Most of the 27 U.S. tourists on board the ship were Northern California men who traveled to the gulf for an annual Independence Day fishing trip. 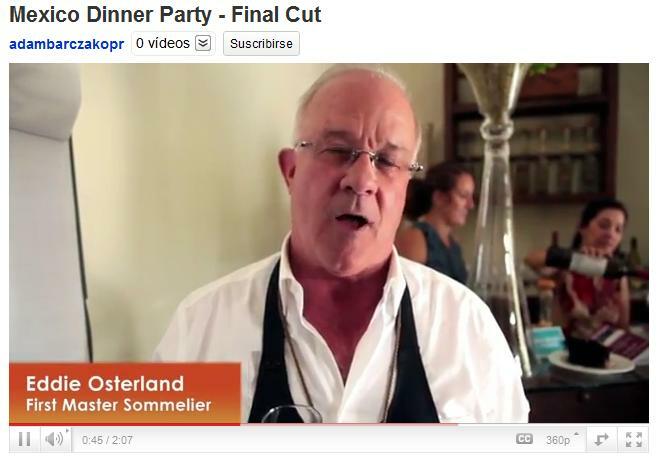 Here's a short slide show featuring open music night at the The Roadrunner Cafe in Los Barriles. I wish I had photos of all the musicians who have come but I don't. If you want to email me photos (bixkitboy@gmail.com), I would really appreciate it. Thanks to all who came. There's bonus photo at the end. I am an author based in the San Francisco Bay Area. I'm reaching out to you because my brother-in-law, Don Lee, and others who were onboard the Erik are still missing in San Felipe. If you're a member of the media and would like to interview families of the missing, please get in contact with me. Thanks for your support and assistance. Johnson was vital part of the SCORE organization for over 30 years. LOS ANGELES—SCORE International, the world’s foremost desert racing sanctioning body and race organizer, lost one of its founding members recently when former Vice-President for business affairs, Ted Johnson, passed away on June 18, 2011. 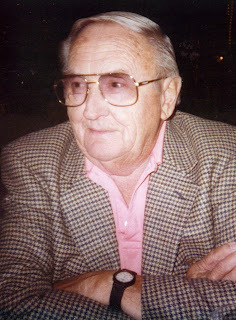 Born January 23, 1919 in North Freedom, Wisc., Johnson, 92 passed away near his long-time California home in Woodland Hills, Calif. from the lingering affects of the serious stroke he suffered over one year ago. Born Theodore Albert Johnson graduated from the University of Wisconsin, served four years in the U.S. Army during World War II, primarily in Italy and received a purple heart. After the war, he helped start the Department of Veteran Affairs at the University of Wisconsin. 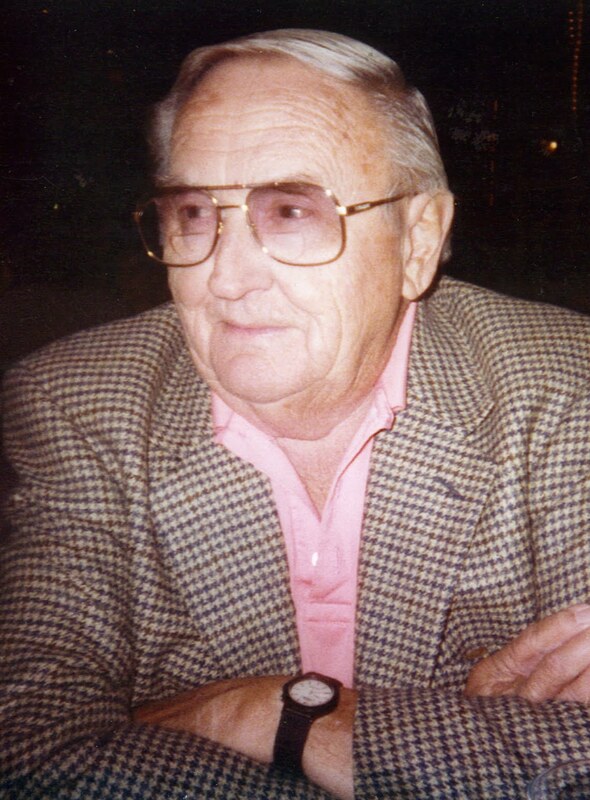 Prior to moving to California in the late 1940s, Johnson worked for Youngstown Steel Products as an accountant. His professional career included time as the vice-president of Schieffer Manufacturing as well as handling the finances for all of Mickey Thompson’s companies. He also assisted Keith Black company for several years and was an active partner with Sal Fish with SCORE until the early 2000s. Ted Johnson and his wife Betty of 45 years (who passed away in 1990) had three daughters, Christine, Nancy and Sue. Sue Johnson is a long time SCORE employee and has been the administrative director for the company for over 20 years. Extremely found of cats, donations are being accepted in Ted Johnson’s name at the Humane Society. Following is the internet address for donations: www.sonomahumane.org/support_us/ways_ to_ give/donations.html. Reports of widespread violence in Mexico instigated a visit from officials from La Paz, Redondo Beach’s sister city, and other Mexican officials to emphasize that the Baja California Sur city is one of the safest in North America and will soon be one of the country’s flourishing tourist destinations. “I have been in power for only two months and I have four and a half years to go with a lot of work to do to have the tourist infrastructure and the security needed to become the new Mexican tourist destination,” Ponce said. Augustin Olachea, president of the La Paz Tourism Board, said that hotel occupancy has been steady and tourism hasn’t suffered much in La Paz despite negative press. This is mainly because currently tourism isn’t the largest attraction to the city. “We don’t have anything related to what’s happening and what we’re seeing on the news about Mexico,” Olachea said. Redondo Beach Mayor Mike Gin touted the long relationship and the similarities between the two cities. Gentil Smith, president of Redondo Beach’s Sister City Committee, expressed the importance of the organization as a conduit for teens through its youth exchange program with La Paz. Teens from Redondo Union High School who were youth ambassadors in 2006 “got this spark” by visiting La Paz and have traveled to other parts of the world, including Bogot‡, Beijing and Costa Rica, to do “good work,” she added.